Passing the CPA exam can be the first step to a long and rewarding career. With CPA Exam For Dummies, you'll get a full overview of the exam, information on how to register, the requirements for taking and passing the tests, as well as a review of the four sections. This comprehensive introductory study guide provides you with a wealth of information, including all the current AICPA content requirements in auditing and attestation, business environment and concepts, financial accounting and reporting, and accounting regulation. From start to finish, the text is designed to prepare you for each portion of this rigorous exam. 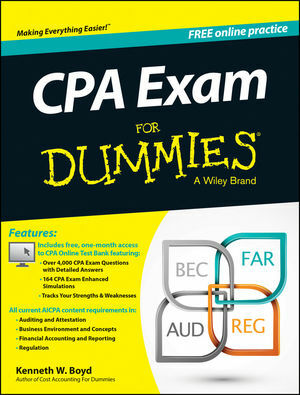 For those seeking to pass the CPA exam and launch their accounting careers, CPA Exam For Dummies is the go-to resource for getting started! Kenneth W. Boyd, a former CPA, has over twenty-nine years of experience in accounting, education, and financial services. He is the owner of St. Louis Test Preparation (www.stltest.net), where he provides online tutoring in accounting and finance to both graduate and undergraduate students.